This week MacKomics Studio is the featured artist on the Kansas Etsy Team blog. Check out my interview and ask me any questions! 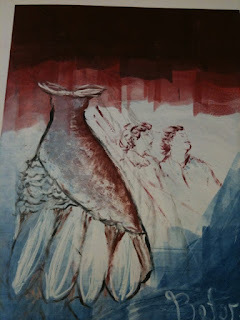 Sneak Peek at a piece from a weekend-long monotype printing workshop with Ron Pokrasso..... This is 28 inches tall! What a pretty dress design. Congrats on being featured too. Your print is fantastic Liza. Congratulations on the interview...it's great. I can't wait to see your March dress...the submissions so far are terrific! My pal, Connie was at that weekend class, I heard lots of good stuff about it from her.